Climate change mitigation and land grabbing are distinct but not isolated phenomena. There is evidence that their intersection and interaction contribute to rapid agrarian transformations with dire social and ecological spillover, including the onset and aggravation of conflicts. 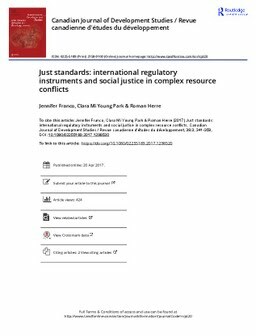 Several existing human rights instruments are applicable to such spillover situations and are preferable to other kinds of regulation, as they tend to be seen as more legitimate by those adversely affected. With insights from Cambodia and Myanmar, this paper argues for a recalibration of analysis and action on climate change mitigation and land grabs that moves beyond regulation in each isolated case and toward integrated solutions.